Joe, a friend that I have reviewed restaurants with before, called me and asked if I was interested in having lunch at Ponce’s Restaurant in Kensington. Mexican food is one of my favorites, so I agreed to meet him at the restaurant. It is very easy to get to – right off Highway 15 at Adams. We met at 11:45am. The timing was good, because even though we had a 10 minute wait for a booth, by noon people were in line waiting for a table. There is a very extensive menu – beginning with appetizers ranging from $4.95-$7.95; soups and salads from $5 to $8.75; combinations where you can choose 2 items, plus beans and rice, start at $9.95 and for 3 items it is $11.95. There are many “Specialty Burritos”, ranging from $5.95 to $6.95; their “Specialty Taco’s begin at $4.95 and range to $8.95. A side of guacamole runs only $1.00. In addition to the “specialties” there is also a section called “House Dishes” that start at $9.95 and go to $13.95; three selections of fajitas ranging from $10.25 to $12.00. There is a small section of “Desayuno’s” – breakfasts – all at $9.95 as well as a small section of “Lunch Specials” from $6.95 – $7.95. In addition to all of the above, there is an extensive “Ala Carte” menu that has almost everything on it that is on the regular menu, save the rice and beans. The beverage menu is also extensive: besides the soft drinks and teas and coffee, there is wine – Santa Tomas wineries – red, white and rose; there are 21 different kinds of tequila; there are 13 varieties of Margarita’s. It also has a full bar. And to top it off there is a dessert menu which includes vanilla ice cream, Fried Ice Cream, flan, etc. Joe recommended the chorizo but since what I usually have to gauge a Mexican restaurant is machaca, I passed on it. Joe had “Carnitas” that came with rice and beans, guacamole, sour cream, and tortilla’s. (He ordered flour – where as I ordered corn.) His order came from the “House Dish section” and there was more than enough on his plate to feel two people. Joe’s carnitas was tasty. The meat was fresh; the guacamole very tasty; the beans fair. He liked mine better than his. The flour tortillas were good. 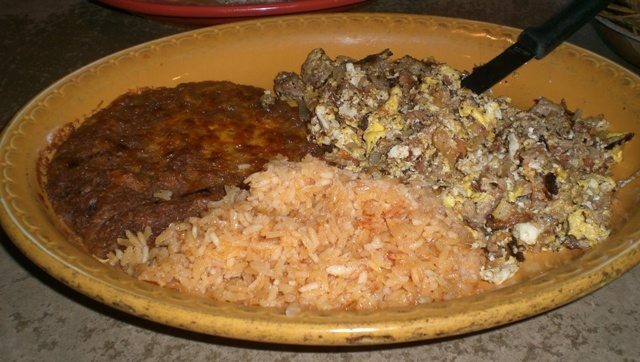 I stayed with the machaca, which I ordered off the “Desayuno” menu, and it had rice and beans and tortillas. But, the refried beans on my plate were over-cooked and had an unappetizing crust on them from being overcooked. Under the crust they were tasty, as was the accompanying rice. Of the 3 corn tortillas, two were good; the third was dried and overcooked. The machaca was okay – but not nearly as tasty as the machaca at El Indio, for example. Something was lacking in the flavor, but there was an ample amount. I would not order it again there. The salsa was okay; it looked more like a commercial brand than home made because it was so thin, but had a nice bite to it. Chips and salsa were served as we took our table. Over all I was not too impressed by the food, and, at times, the noise was so loud that I could not hear Joe across the table. However, I would try it again because the other reviews I have read have been very good. I would not order either of the two items we had today, but it is always fun to try new things, so I’ll be back. I agree with you Judi, your Machaca wasn’t very good. I’ve only had it twice and neither time was it to my liking. I just assume that it’s a dish I don’t care for. I have had several menu items here and enjoyed each one. The serving size is perfect for leftovers, or to split if you are on a budget. I’ll invite you again and we can each try something else. Let me know when you want to go. Going to try the chorizo next time. I think. I would definitely recommend trying it again. This is one of my staples. Maybe it was a bad day. I’m very surprised the beans came out the way you described because that’s never been my experience, and I’ve never thought they tasted like canned. The noise on the other hand I’ll agree with and being the kind of neighborhood Kensington is and Ponce’s sort of a hipster Mexi place I doubt the noise issue will ever change. Still I consider them my fave in San Diego due to the quality of the food so again I suggest trying it one more time. I will be going back – soon. The other reviews I read were good so maybe machaca is just not of their “specialties.” A friend of mine remembers as a child going to Ponce’s and said it hasn’t changed much – except the menu is larger. I’ll post a “postscript” after my return. I love Ponce’s because I used to go there occasionally with Marc Knapp, the fiery, funny, stubborn and wonderful head of the San Diego Teachers’ Union, aka SDEA. He helped me get elected twice to the School Board and I helped him when the teachers were dealt a bad hand by a punitive non-educator Superintendent of Schools whose name I refuse to place in the same paragraph with Marc. Anyway, Marc died cruelly and untimely a few years ago after both he and I retired. I still miss him, but I think of him every time I am in the neighborhood of Ponce’s and when Dia de los Muertos rolls around. We sometimes disagreed on things — even at his deathbed — but we shared much in common and he was as genuine, unpretentious and gemutlicht a person as Ponce’s is a longtime family enterprise. Marc Knapp and Ponce’s Mexican Restaurant go together in my mind in the best possible way. Glad that you have such fond memories, Fran. They are what keep all of us going day to day. I will try Ponce’s again soon because I have heard many good things about the restaurant. Your memory will spark me to go sooner rather than later. There are other (better) Mexican restaurants on Adams Avenue. It is way to loud to carry on a conversation with your table-mates. We sat by the kitchen where ironically it was quieter. The food is just average. Nothing special to write home about. Oh say 30 years ago perhaps Ponce’s was “special”. Not anymore, they are out dated and not up to this Mexican foodie’s standards. If you are stranded in Kensington and have to have Mexican food, walk down the street to Villa Del Mar for better quality eats. Thanks, Mr. Groucho. A friend told me she used to go to Ponce’s many, many years ago and that time it was good. She said she was disappointed the past two times she was there. And you are right about the noise. I will have to try the Villa Del Mar next time. Thanks for the hint. 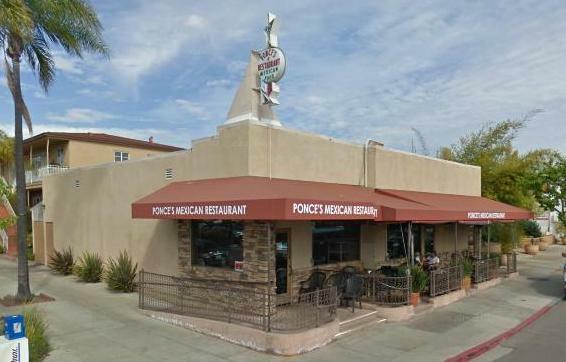 Sadly, my wife and I consider Ponce’s all but lost now–like other pages from our youth that have fallen to the changing times–like Don José’s up on El Cajon Blvd. or the old College Restaurant down nearer to La Mesa (how long has it been since a matronly waitress in a beehive hairdo called you “Hon” and really meant it?). Ponce’s used to be great home-style Tex-Mex food served in an old funky (gemütlich, even!) place that was dark and cozy–and not NEARLY so loud and brash inside. Since the remodel years ago I’m afraid they have ruined it irreparably–the carpet is gone and the concrete/tile floor plan opened up allowing the noise to echo painfully. Now not only is it harsh inside, the food has also gotten unpredictable. We now mourn its loss like the death of an old friend–we still visit Ponce’s grave now and again–and every time are reminded of how much we miss him. Jaimie, so sorry that you feel Ponce’s has gone downhill so badly. There are so many restaurants that have done the same thing recently. Some started out so good – “Embers” on Midway and Sports Arena, for example, that have shut their doors after changing owners. (But it appears that a new Mexican restaurant is going to open there soon.) Thanks for your feedback. I won’t feel as badly when I review it again if it is not good. Las Olas is the new one replacing Embers. There’s on up in Cardiff and another in Carlsbad. I’ve been to the one in Cardiff a couple times and I think it’s pretty decent. I’m very surprised to see so many disappointments with Ponces. I started going there about 4 years ago and have never been disappointed. I guess it’s just a matter of preference.